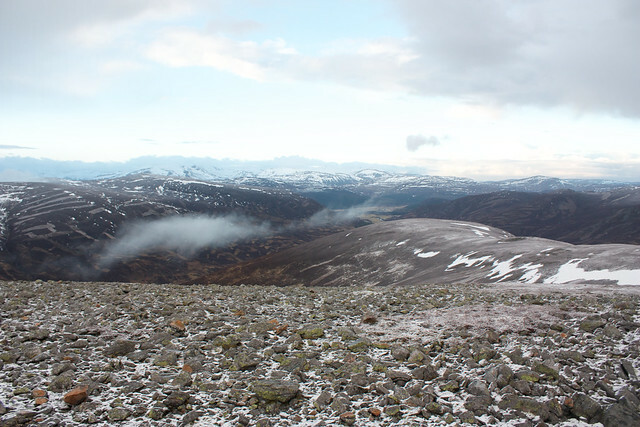 I'm fairly sure that I am now a member of an elite and rather exclusive club: a club for those who count Tolmount as their most climbed Munro. 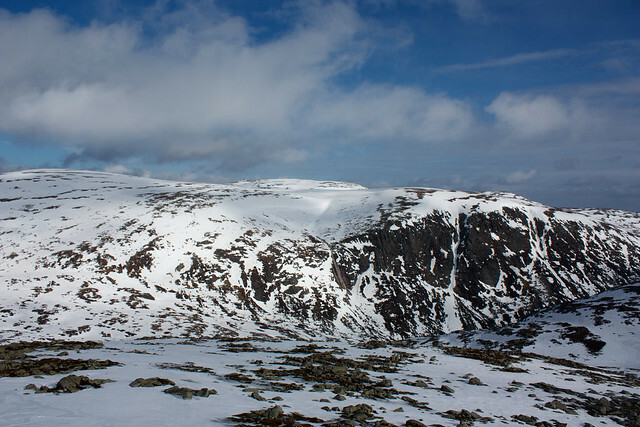 Although I have almost been up Lochnagar three times, I aborted the last time in the face of incredibly strong winds, so now, having climbed Tolmount in May 2008 and again in August 2010, today was my third time on top of this mountain. 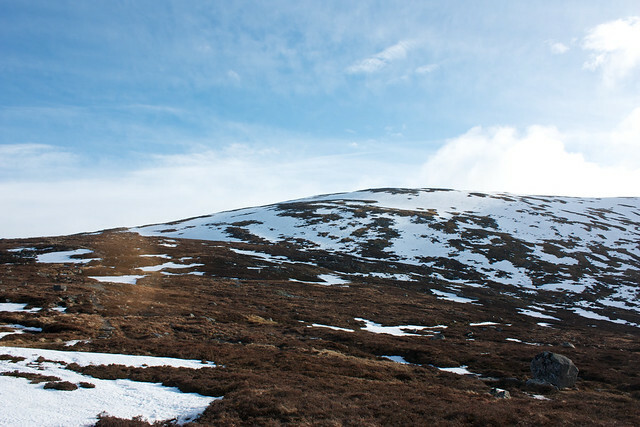 Its summit came at about the halfway point on a new route I devised that took me around the high ground that surrounds Glen Callater, one of my favourite eastern glens. 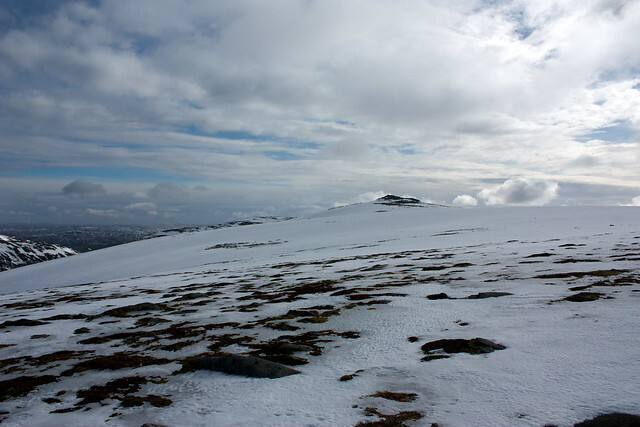 I had two objectives in planning this route: one was to climb the Corbett Creag nan Gabhar, which sits between Glen Callater and Glen Cluanie; and the other being to get a view from the Munro of Cairn Bannoch, something which I missed out on when was up it in May 2009. To link these two slightly separated hills I had a long day that would ultimately be hugely rewarding, both for the views and for the distance covered. Leaving Aberdeen at 7am, I was under grey skies that darkened and turned to torrential rain as I passed through Banchory. 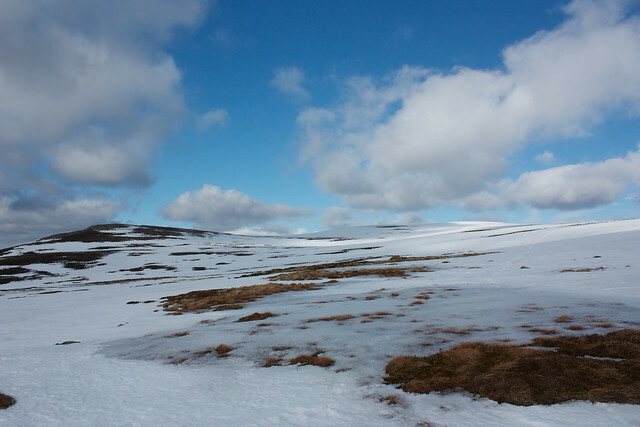 Luckily though, as I went further west, passing through the sleepy Deeside villages, the weather gradually improved. Although I set off under grey skies from the car park at Auchallater, there was hints of a brighter sky to the northwest and the weather forecast had confidently predicted sunshine by midday. 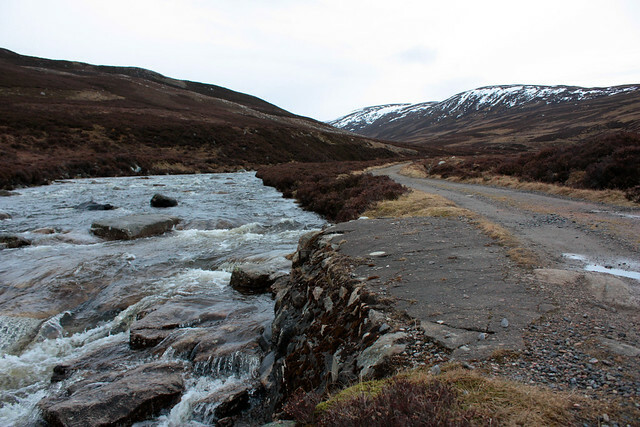 I followed the usual route along the main vehicle track which runs beside the Callater burn all the way through the glen to the lodge buildings at the foot of the loch. 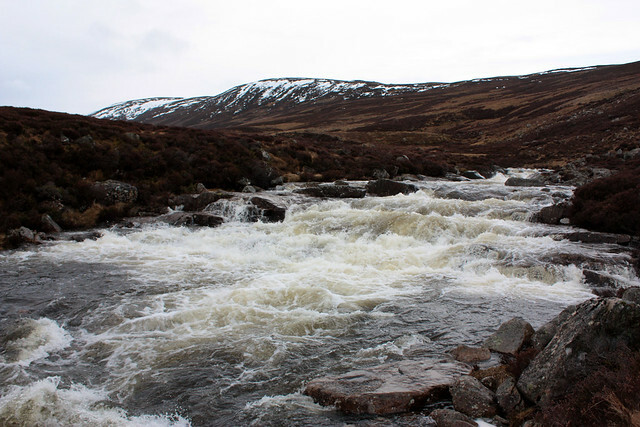 The air was chilly, still unsure of what kind of a day it wanted to be, but the fullness of the river was a sure sign that the recent thaw had had its effects in the mountains. 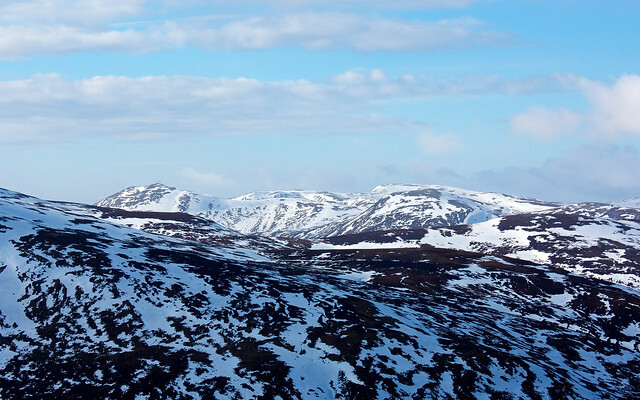 Gradually the higher hills, which crowd in around the southeast end of the glen began to appear, each one with a healthy covering of snow. 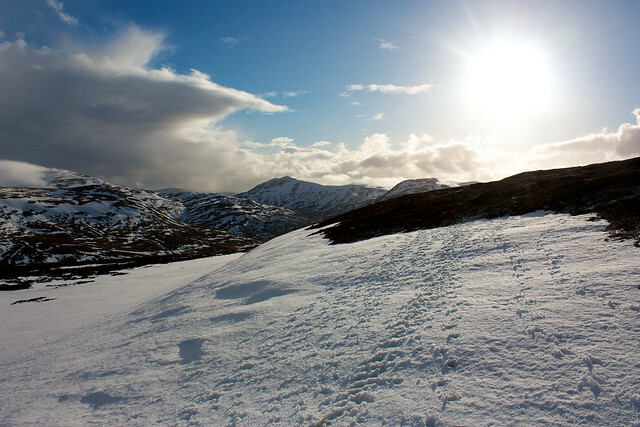 It's a decent leg-stretch through Glen Callater and I was warming up nicely as blue sky began to slowly creep above the western hills. This was an encouraging sight (not that I doubted MWIS of course!) 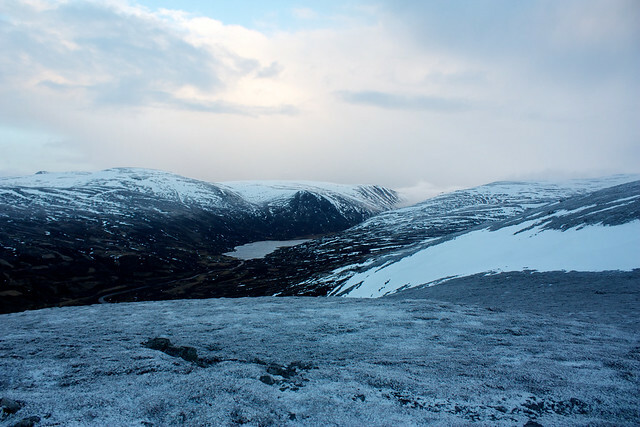 and sped me on my way up the stalker's path which climbs above the loch on its east side. 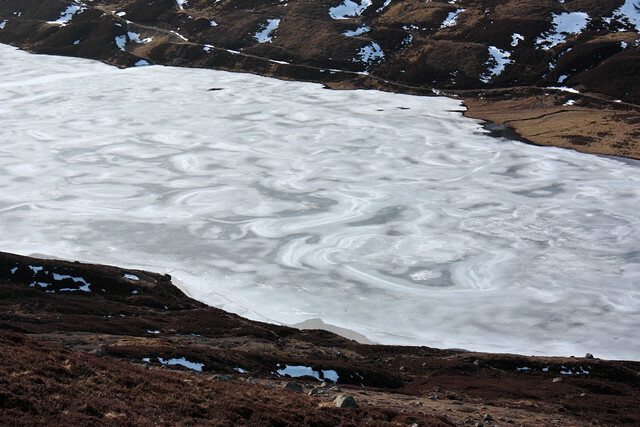 Loch Callater itself was still frozen, the ice held in rich, textured swirls. 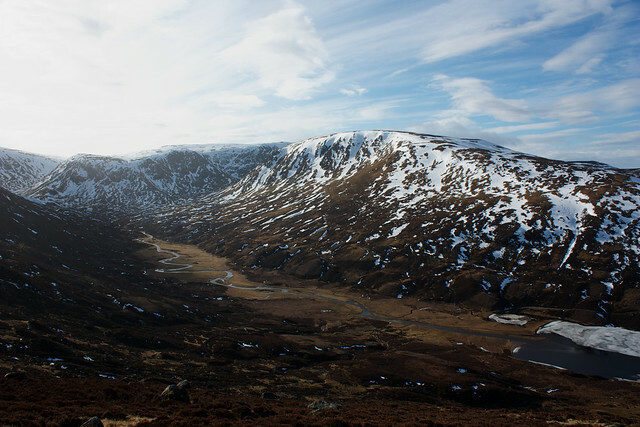 As I climbed the sun was slowly revealed, lighting up the mountains and picking out the sinuous shape of the burn which tumbles down from Coire Kander and Tolmount. 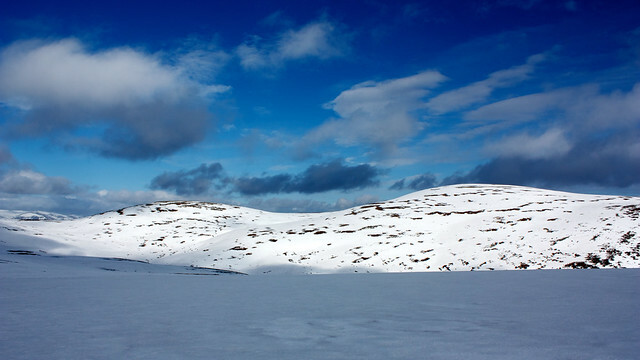 Turning the corner, I followed the track across several short sections of softish snow until I reached the boggy bealach below Carn an t-Sagairt Mor. 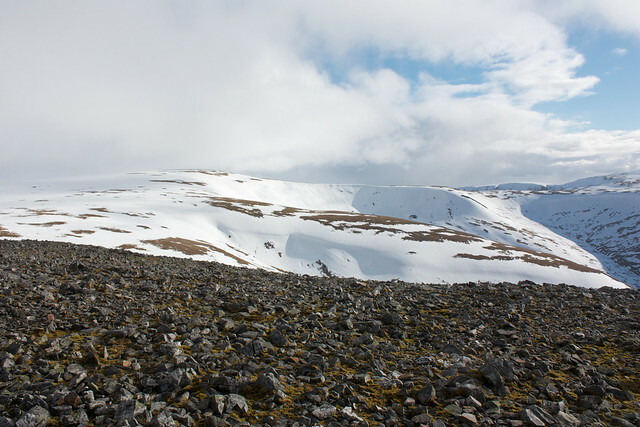 I had previously come this way on another long walk in April 2008 when the snowline had been lower and the bealach had been buried and featureless. 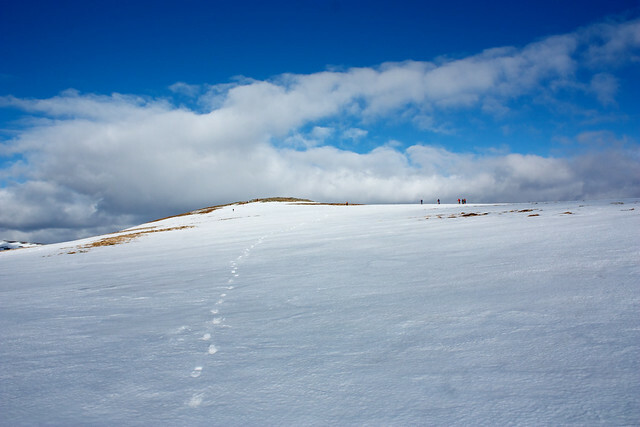 Now I was able to follow the track as it darted up the lower slopes of the mountain, coming to a stop only at the first significant band of snow some way up the side. 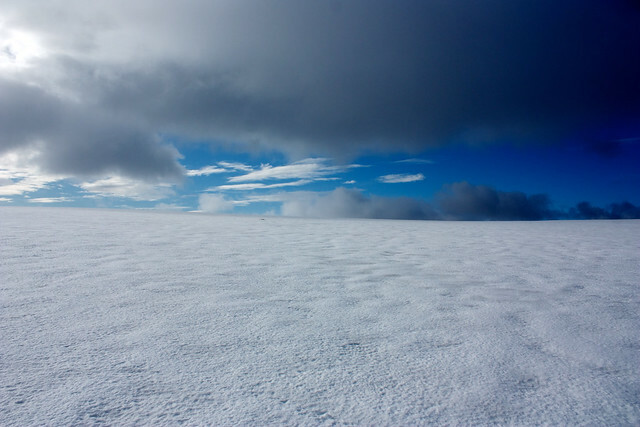 Here I decided it would be prudent to put on the crampons as the surface was incredibly icy and there were no sign of other footsteps to follow. This made the going much easier and luckily I only had to pick my way carefully across a few vegetated areas, trying not to catch my spikes on unforgiving rocks. 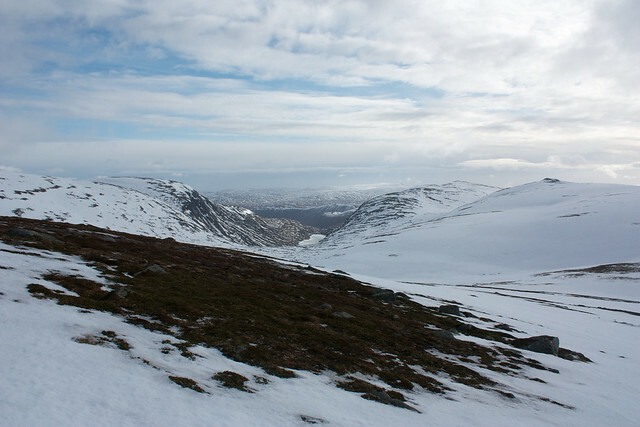 Behind me the views were opening out, both to Ben Avon and across to the Glenshee Hills to the west of the A93. Though I was in the shade as I climbed, sunlight was illuminating the landscape all around, setting off the striking whites and greens. 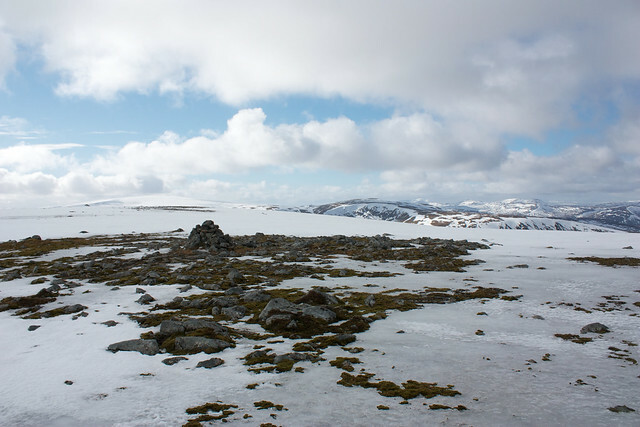 Eventually the snow thinned and then completely disappeared as the slope eased off and I came up onto the summit plateau and the lower of the two cairns. 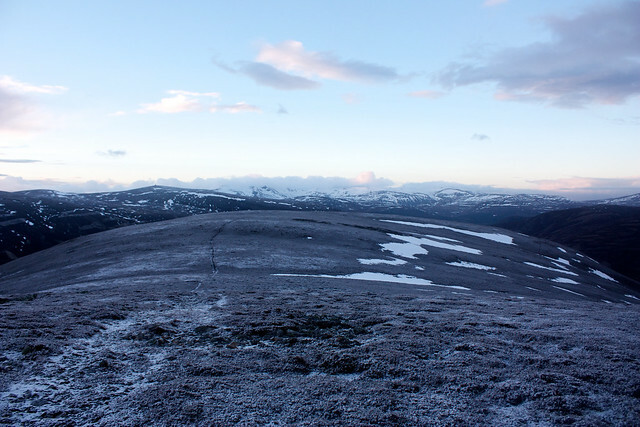 I took off my muddy crampons and after stopping to admire the view back to the main Cairngorms, ambled over to the summit cairn for a quick sit down and a brew. The sky was still clearing to the east but already I could see the mountains emerging from the gloom of the early morning. It was a fabulous, quiet place for a sit down. 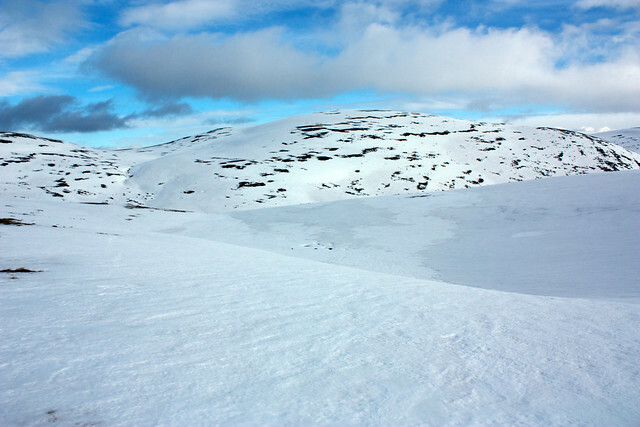 After this pause I now continued on my way, following a rough bearing south down another consolidated snow slope (crampons back on!) 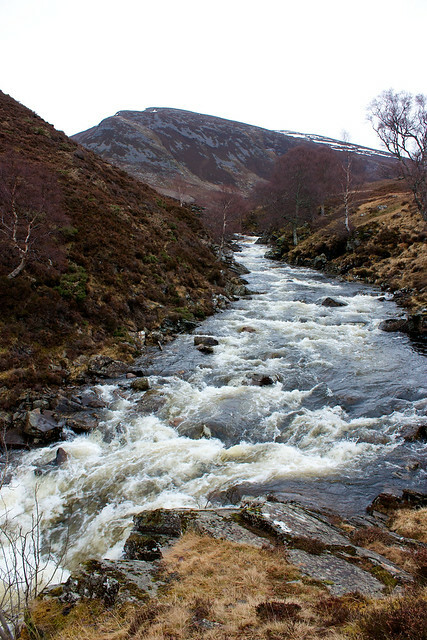 and around the lip of the gently sloping coire that drains into the Allt an Dubh-loch. 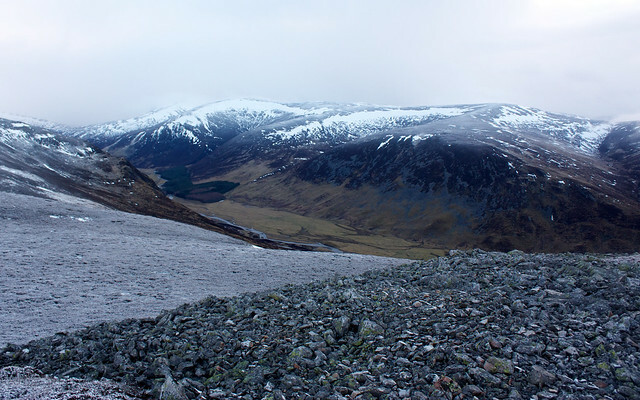 As I wandered through this barren landscape, enjoying the views along to the Eagle Rocks below the White Mounth, I saw another solitary walker who had evidently come up from the Dubh loch and was heading towards Carn an t-Sagairt Mor. 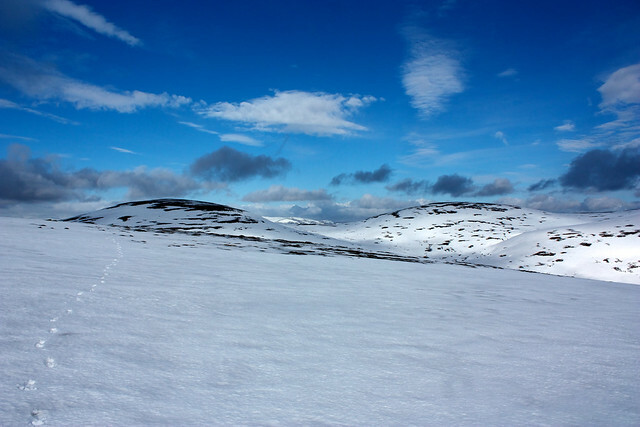 I made my steady way across the gently rising slope, my destination now clear in the distance. 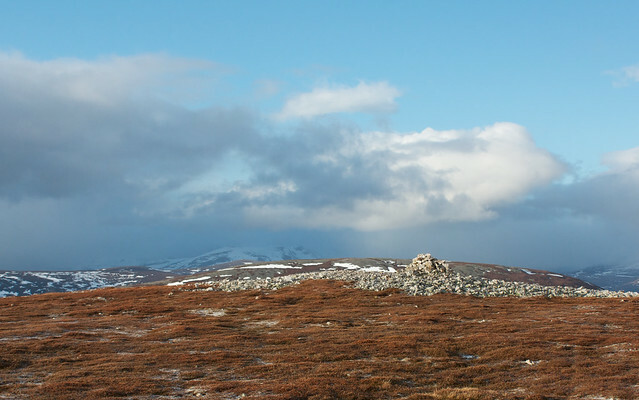 Cairn Bannoch has virtually no prominence from this side but was nevertheless easy to spot. 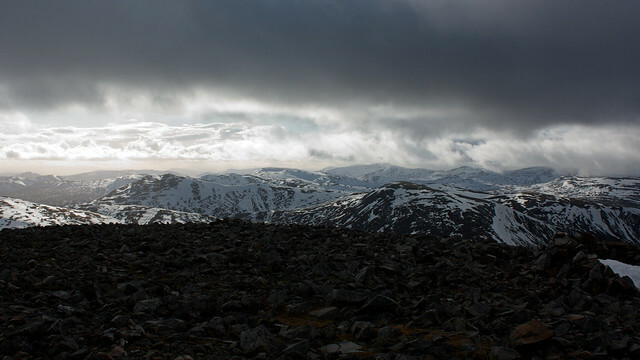 All around me the skies were improving and I had excellent views along the White Mounth, including Carn an t-Sagairt Beag and Cairn a&#8217; Choire Bhoidheach, all the way to Cac Carn Mor on Lochnagar. 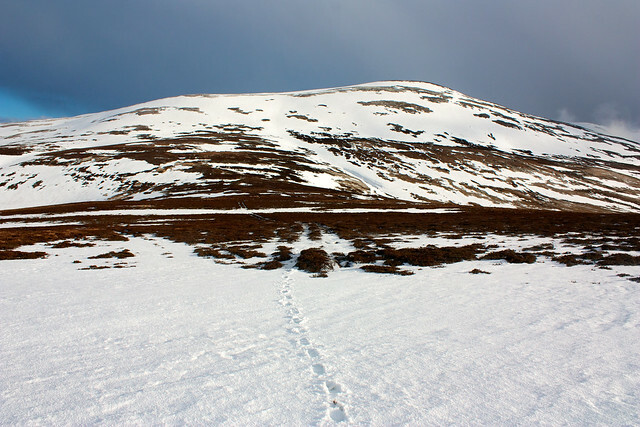 Eventually I came out onto the broad plateau that links Cairn Bannoch to Fafernie, and here I came across my first set of clear tracks. 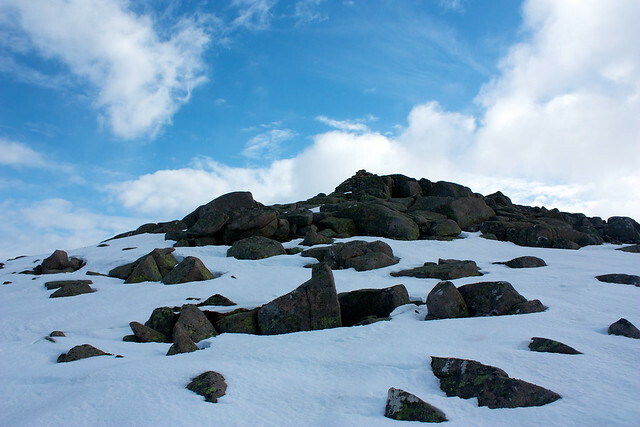 I followed these up to the summit and enjoyed a brief scrabble up the rocks to reach the sunlit summit cairn. 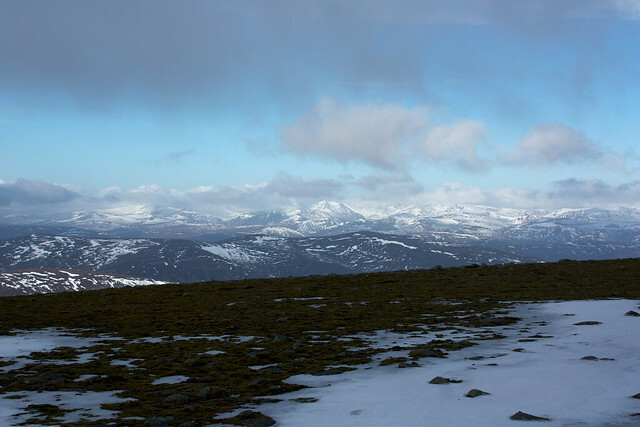 My first objective, a clear summit, had been achieved and now I was able to stop for a proper break and take in the glorious views which extended out across Broad Cairn towards the Deeside Hills and further afield to Tolmount, Tom Buidhe, and the Angus and Perthshire hills. The clearing skies were spectacular. 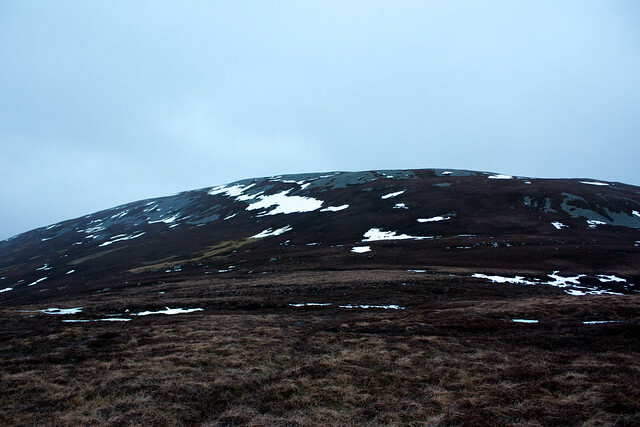 After some food, I decided to cut short my original route which had included the easterly Munro of Broad Cairn. 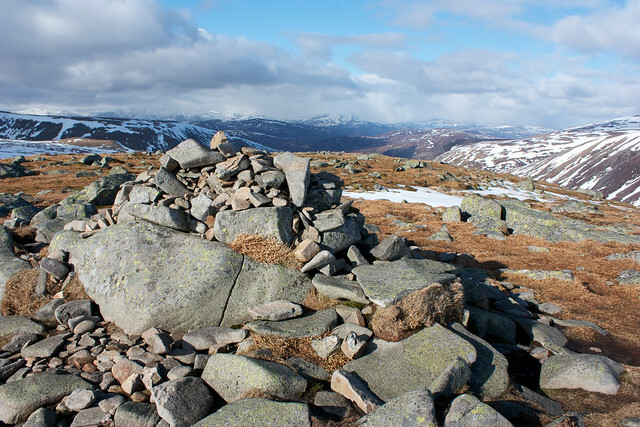 The out and back didn't really appeal to me and so I retraced my steps off Cairn Bannoch but now turned and climbed up the gentle rise to its neighbour, Fafernie. 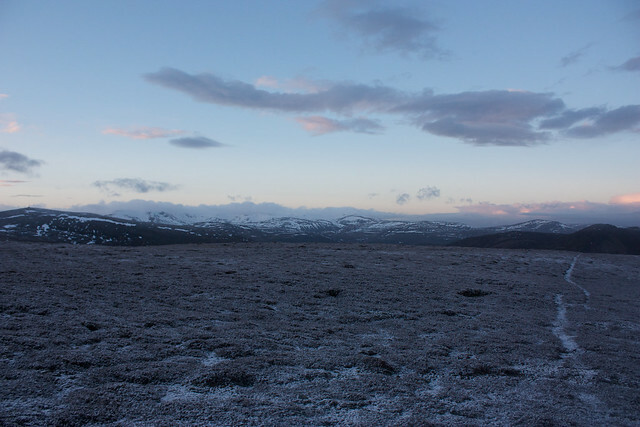 I had a brief stop here to look back across the Cairngorm plateau where all the main peaks were now largely free of cloud. 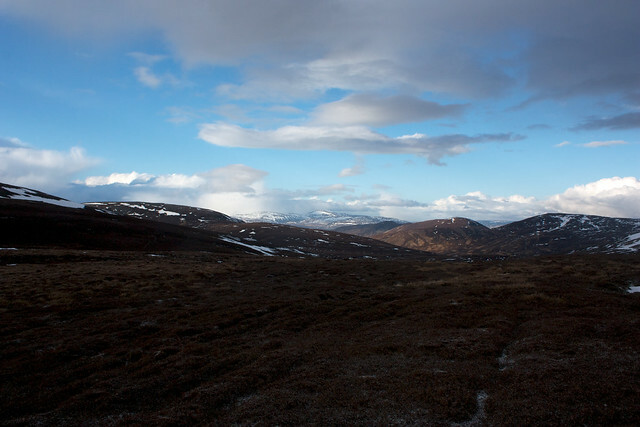 The wind up here on the exposed plateau was chilly though so I continued on my way, following the broad line of the plateau which now loses a small amount of altitude to the area above where Jock's Road plunges down into Glen Callater. From here I would be heading up Tolmount to continue my high level route. Again I was in a quiet world, with no sign of any other hikers anywhere. The sunshine was bright and welcoming, and the temperature just about perfect. I now had the short ascent of Tolmount to make. 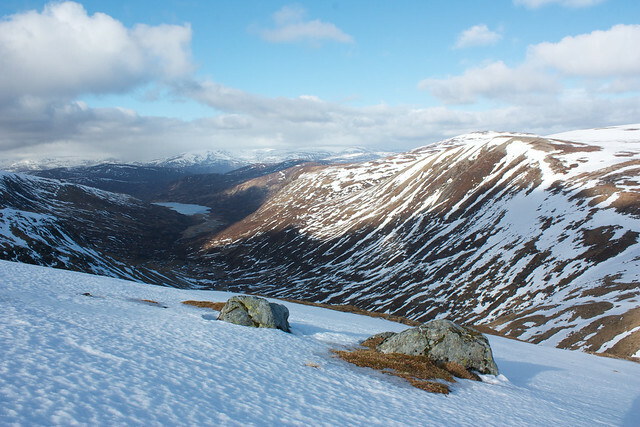 As I got higher I began to glimpse views into Glen Callater and to make the most of this contoured around onto the north side of the mountain to appreciate the grand vistas. 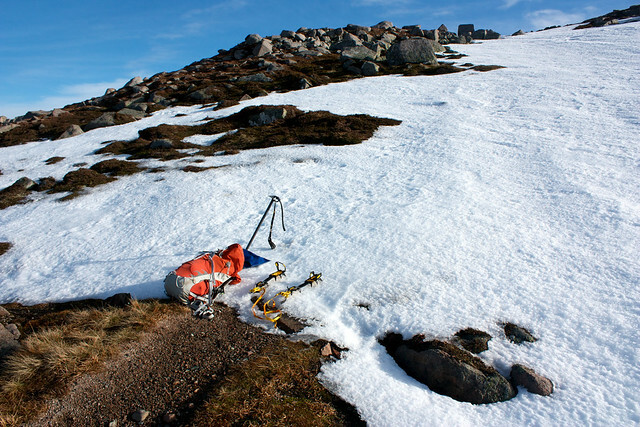 The snow here was very hard packed and icy and I was glad I had left my crampons on as footing wouldn&#8217;t have been great without them. 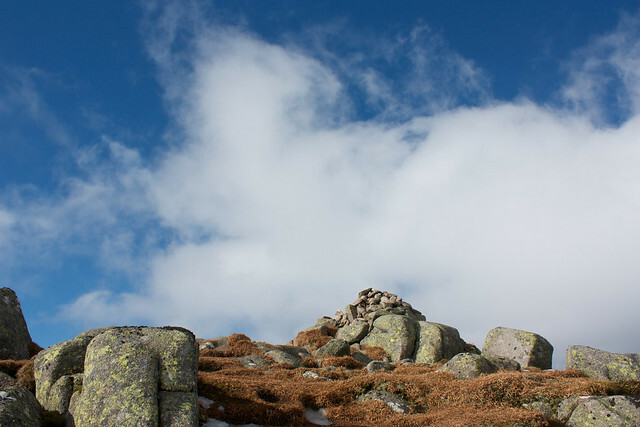 After a few photo stops I made my way up the final few meters to the summit cairn, peaceful, sunlit, and the perfect place for lunch. 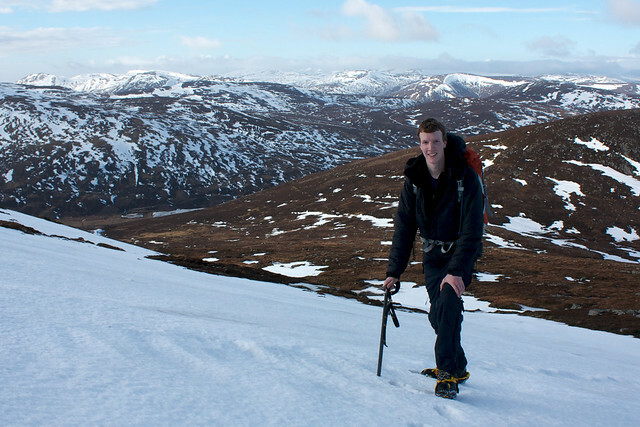 After this break and a chance to remove my crampons, I made my way down off Tolmount, passing between to crowds of oncoming groups, one set skiing up from Tom Buidhe, and the others walking up after visiting Carn an Tuirc. 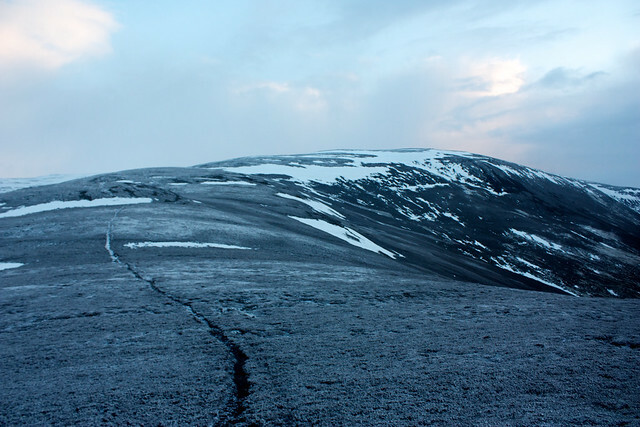 As I was heading to Cairn of Claise I passed almost middway between the two of them, dropping down to the bealach and then taking a bearing for the summit plateau. 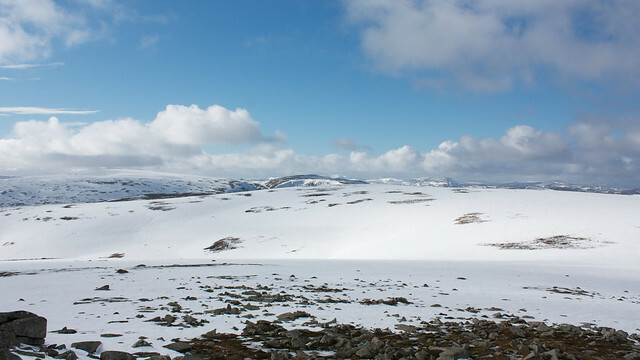 I remember from my walk across these hills in May 2008 that this area is incredibly boggy and was very grateful for the snow and ice cover. 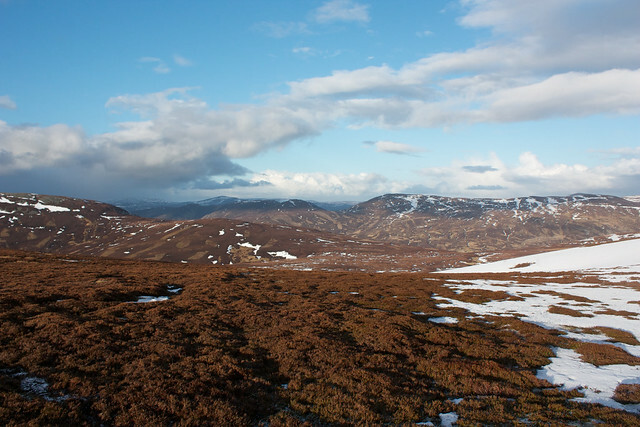 It made the going very easy and the distractions of the afternoon sun illuminating the lands down to Perth made short work of the distance. 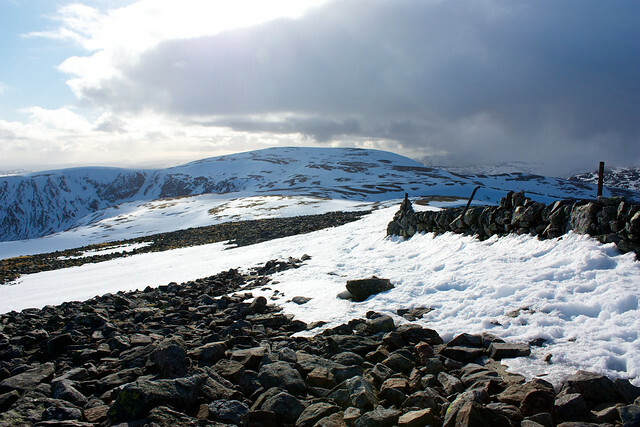 <p>I joined the line of the old wall, almost buried by the snow, and follow it up to the large cairn which marks the summit of Cairn of Claise. 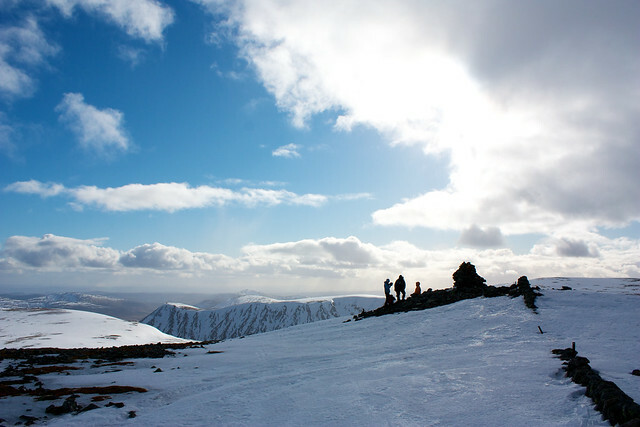 Here I actually spoke to the first other humans of the day, as three people had gathered on the summit, one waiting for partners to return from Carn an Tuirc, and the others ready to head back towards the ski centre at Glenshee. 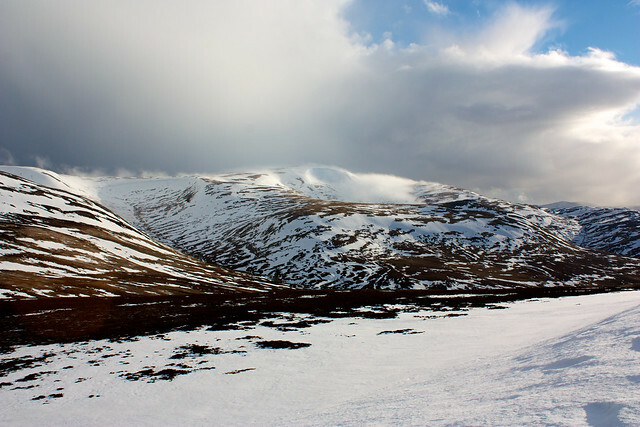 I stayed for some time, enjoying the views across to Glas Maol, and chatting with the guy, before making my own way off, now turning sharply to the north to make my way over to Carn an Tuirc. 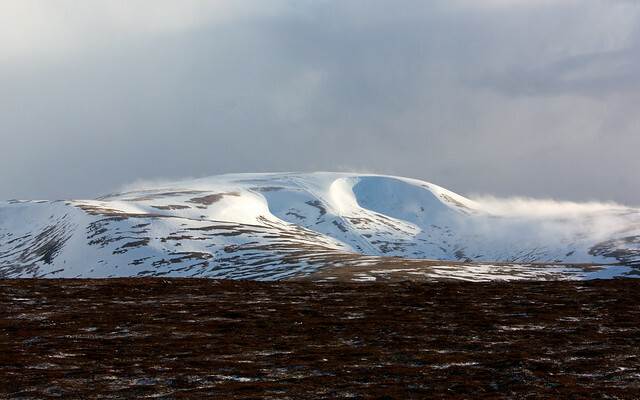 I had already watched as a heavy snow shower developed over the Cairngorms. 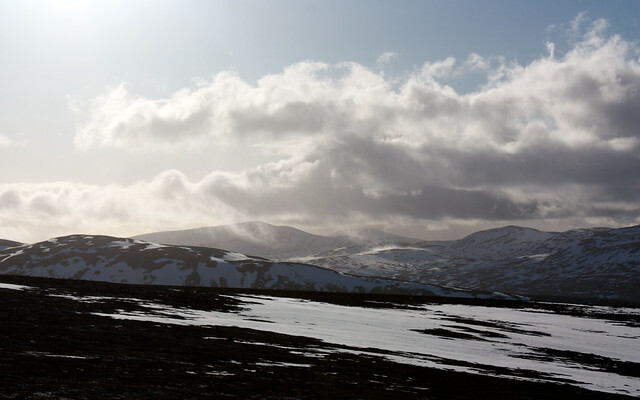 This first one passed to the north of me, carried on a northwest wind until it shrouded Lochnagar. 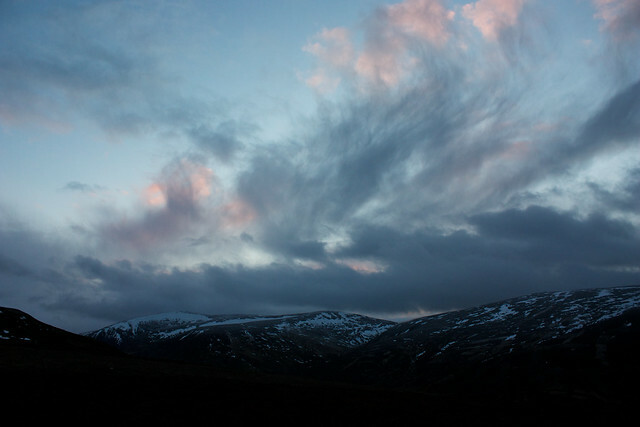 I began to drop down to the bealach but before long a second shower had been blown in, this one making straight for me. Visibility dropped to just a few hundred feet and the world became dark and cold. 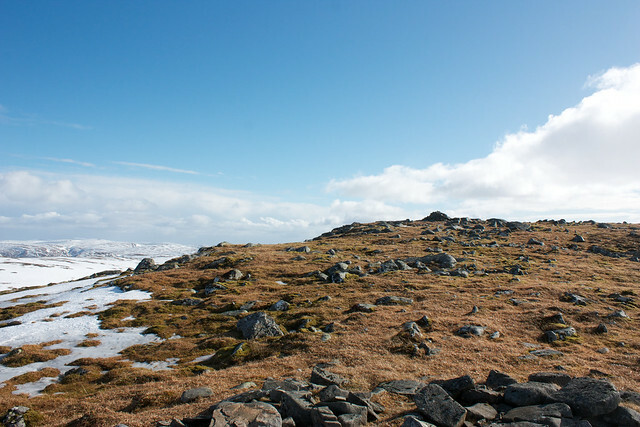 Nevertheless the terrain wasn't difficult and luckily, as I climbed up onto the rubbly summit plateau of Carn an Tuirc, the shower blew through, once again revealing the surrounding mountains, bathed in late afternoon sunshine. 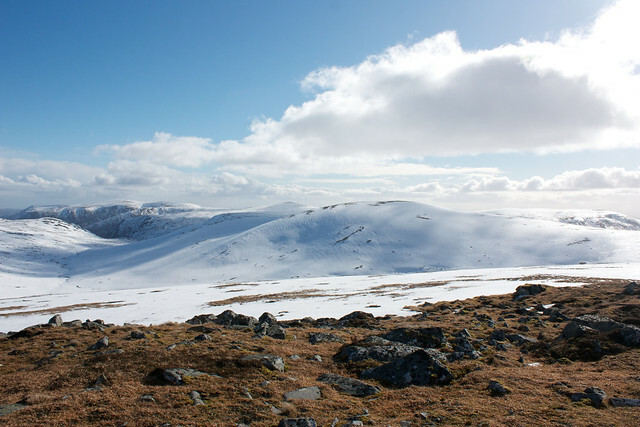 After a brief brew and a bite to eat on Carn an Tuirc I now had to make my way to Creag nan Gabhar, either skirting around, or crossing the intermediary top of Carn Dubh. 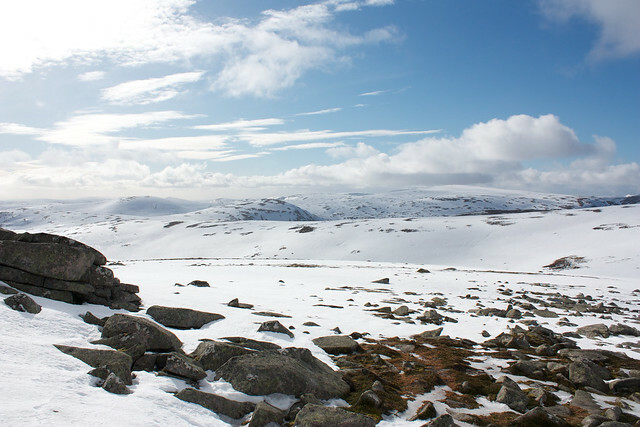 First though I had to get down the steep northern slopes of Carn an Tuirc. 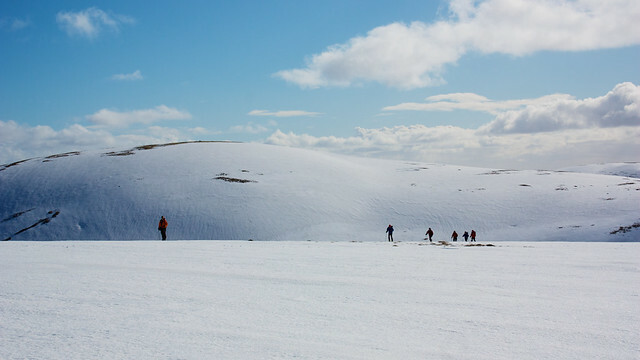 To do this I contoured around to one of the wee burns which falls down to the boggy bealach and there I (for the third and final time) put on my crampons. 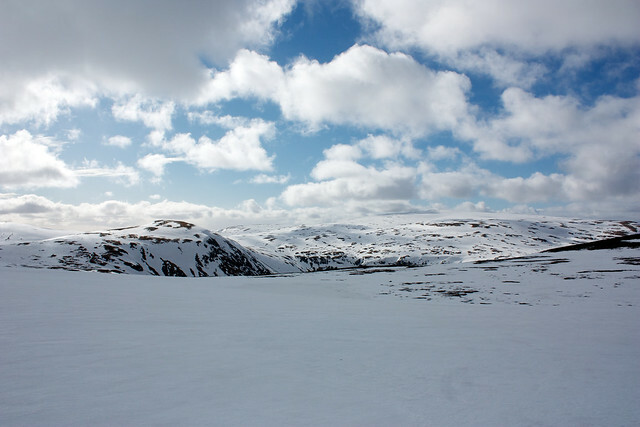 Initially the snow was very icy and I was glad of their bite but as I descended further the snow softened and it was soon a wade to get down to the bealach. For the final third I was engulfed in a second snow shower that this time brought a stinging hail with it, blowing right into my eyes. 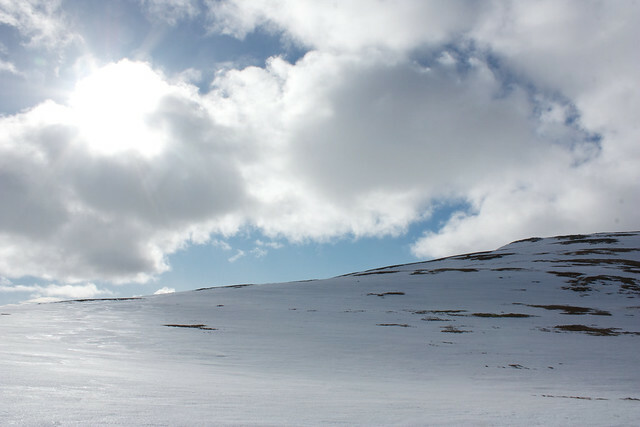 It wasn't pleasant so as soon as the slope eased I stopped, took off the crampons, bundled on an extra layer and (for the first time ever!) put on my ski goggles. 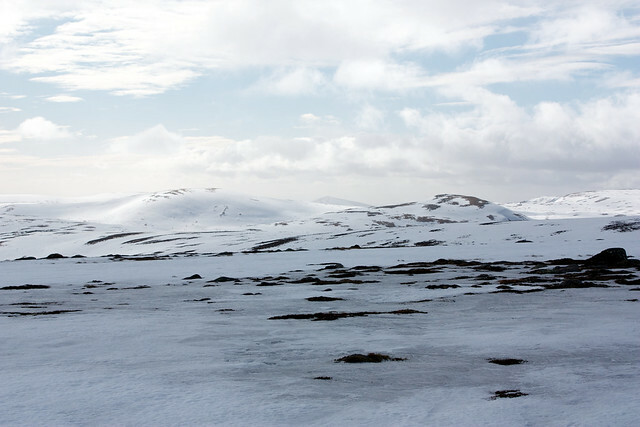 Now I was set to go, and in the face of a shower that varied between sleet, hail and thick, wet flakes of snow, I felt entirely protected and comfortable in my gear. 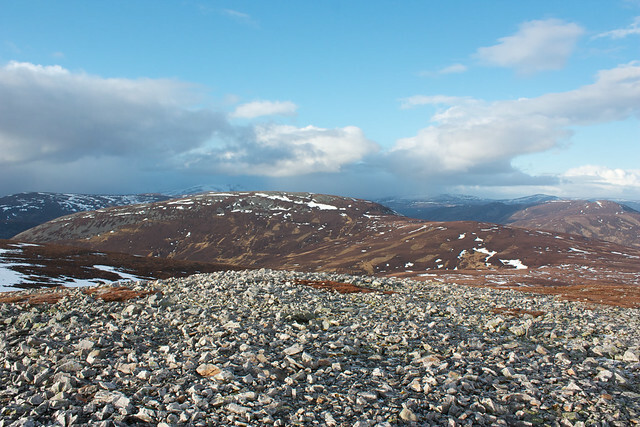 I made my way up onto Carn Dubh and as I did so, again the clouds passed overhead and I was in the sunshine once more. I could now see a large herd of deer on the skyline but despite my best efforts they got wind of me and scampered off to the west. 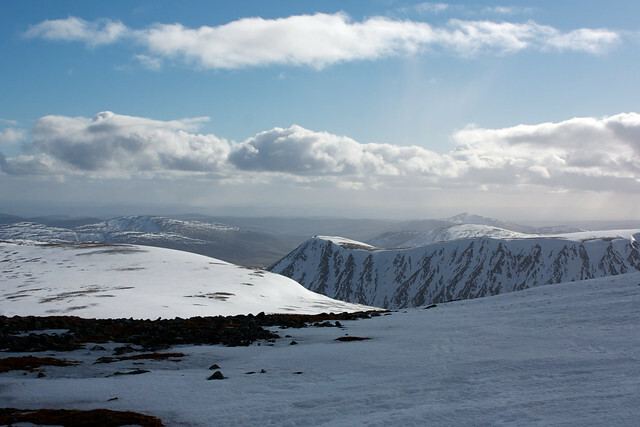 The views across to Glenshee and back to Cairn an t-Sagairt Mor were excellent and it wasn't long before I was on the summit looking across to the day's final hill. 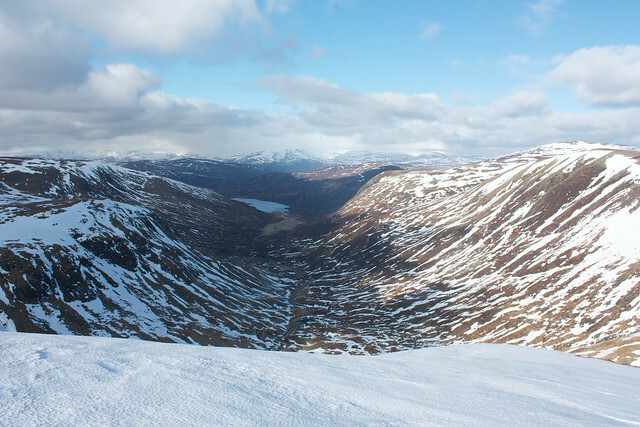 I now made my way around a broad coire rim before picking up a good vehicle track that dropped me down to the bealach where a track comes across from Glenshee to Loch Callater. 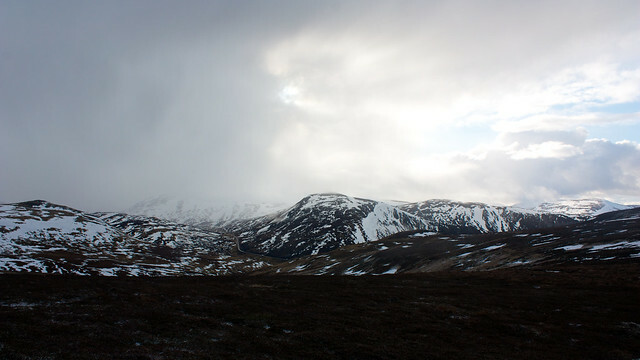 Views initially were good, with the Glas Tulaichean hills picked out against an atmospheric sky, but as I reached the crossroads, another shower came in, this one thicker and darker than any of the previous ones. I had a brief view of the way ahead, a curving track that climbed the broad southeastern shoulder of the hill, but after this it was head down and climb up through a misty world until I was on the rocky summit. 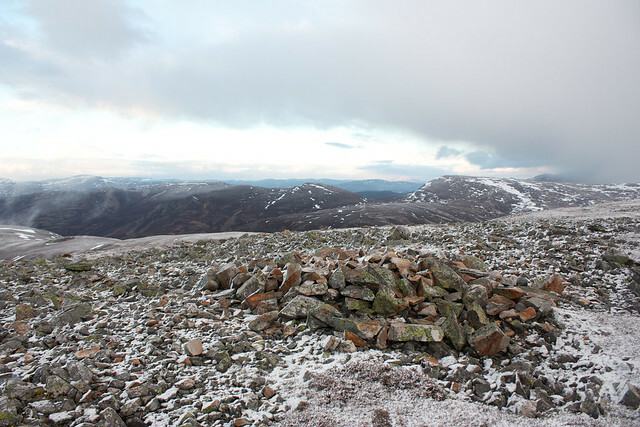 There are a number of cairns up there but with the help of my GPS I picked out the indistinctive pile of rocks which marks the true summit. I stood for some time, facing into an oncoming blizzard that soon had me plastered in white snow (again, my goggles did a great job and I stayed nicely cosy in my winter jacket). After all, this was my second and final objective for the day. It would be a shame not to get a view. Luckily, just as I was about to give up I glimpsed a pale sky and moments later the blizzard had eased to drifting flakes as the wind dropped and I was out of the storm. 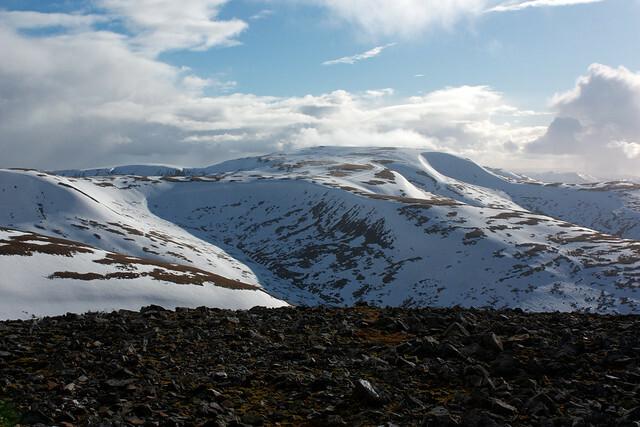 I now had a great view down the length of the ridge which sits between Glenshee and Glen Callater. 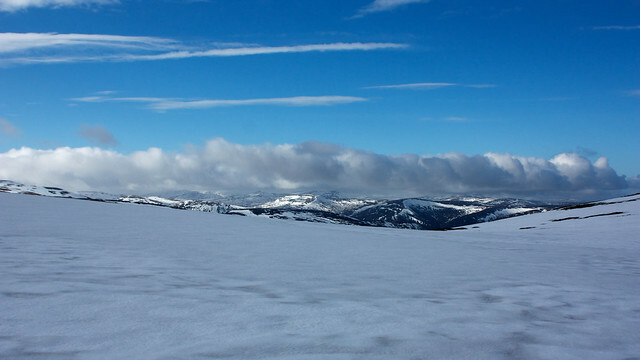 It was an ethereal grey-white with the fresh snow cover and tendrils of clouds still clinging to its edges. 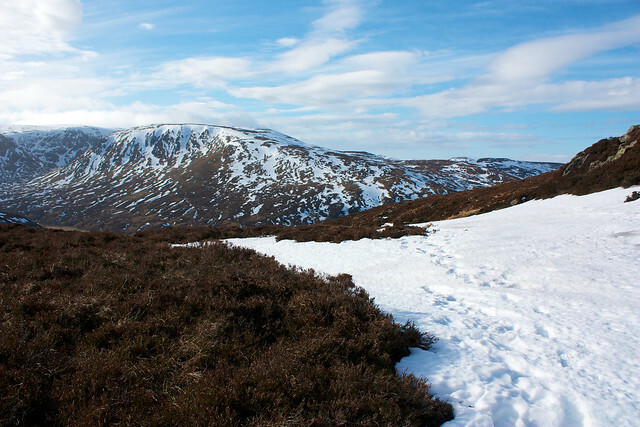 I could also see the distinct track which runs down its length and it was this that I followed. It was a delightful time. The track was good and easy to follow. Hush had descended on the land with the setting sun, and there was a strange quality to the clear post-storm air which is not really picked up in the photos. 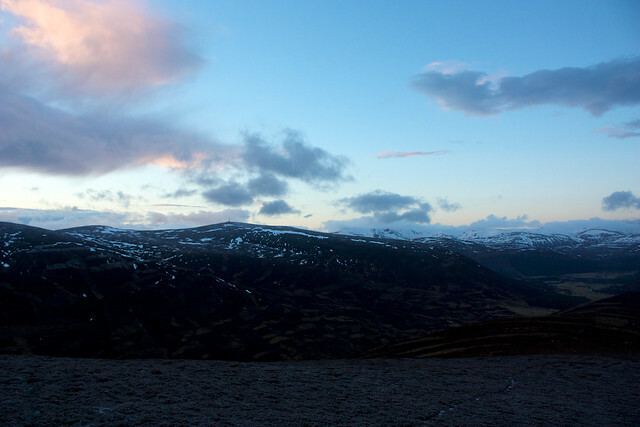 As the ridge continued I got views back down towards Loch Callater and then northwards to the Cairngorms with Morrone and the lights of Braemar in the foreground. 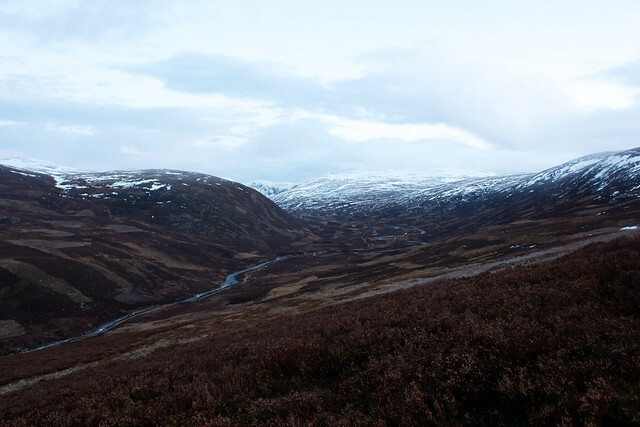 Finally I reached the end of the long march of hills and here the track turns and drops rapidly into Glen Callater. With the light fading I had my headtorch but didn't need it as the clear skies ensured there was adequate illumination. 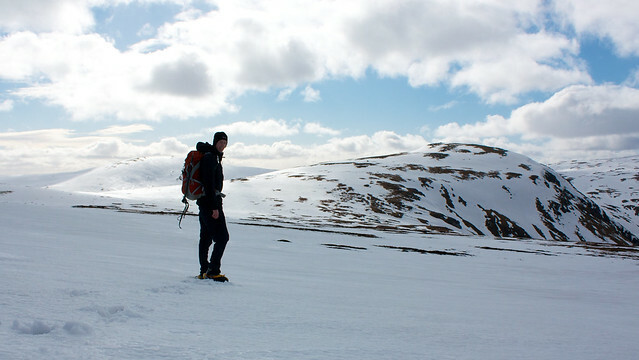 As I dropped to the glen I saw a couple of guys with big bags heading towards the loch. I rejoined the main track for the final short walk back to the car. I was back at the car just as it got fully dark at a few minutes past 6. It had been a long, but incredibly rewarding day. 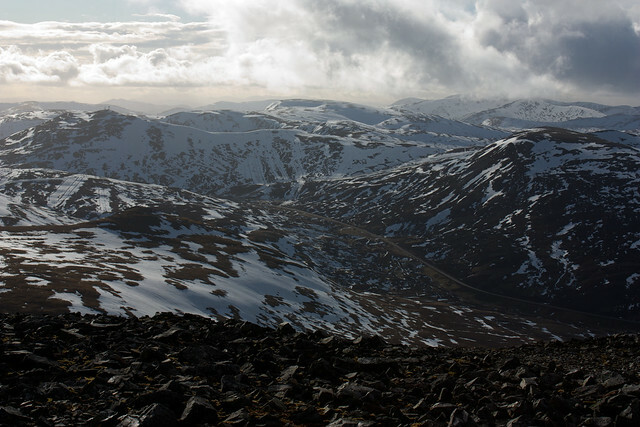 I had successfully ticked off both my objectives, enjoyed some interesting weather and had some exceptional views. On the drive back to Aberdeen the skies got clearer and clearer until the stars were piercingly bright, even through my windscreen. At a suitable parking spot I parked up to get a couple of shots. Unfortunately they weren't quite in focus but do show what results should be possible if I dedicate a bit more time to getting shots this far away from the city. Last edited by Astronick on Fri Mar 11, 2011 10:49 am, edited 1 time in total. Excellent report Astronick! Couldn't ask for a better looking day than that. Really enjoyed that route . 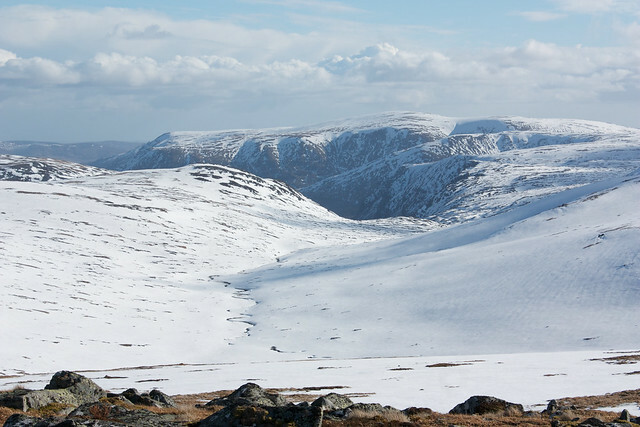 It's a great area for picking and mixing different lines between the hills, and not that far removed (although a bit longer) than the route I did when I was left with just Carn an Tuirc and Carn an t-Sagairt Mor left to do in this area. 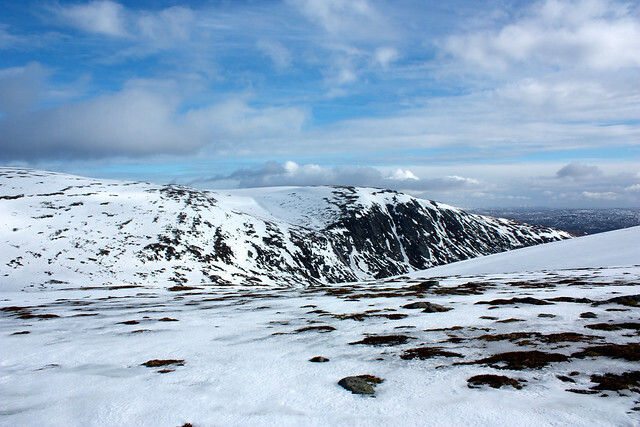 Although not my most climbed Munro, I've ended up in a similar situation with Cairn Bannoch. Such a slight hill, and not much of a target, but due to it being on a crossroad of sorts, I've now been over it 4 times. 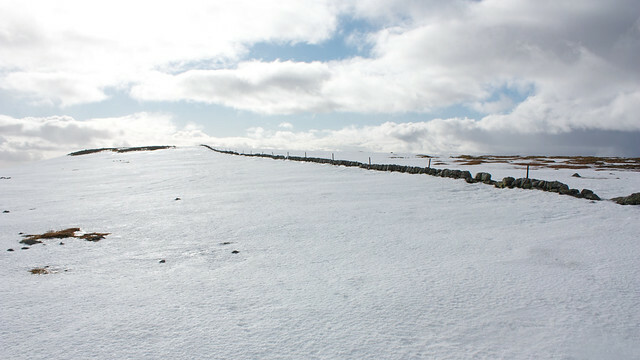 If the weather had initially been poorer would you have cut any more distance / tops from your walk ? An epic day! A stunningly good report with fine descriptions of the changing weather and light, and photos that show how time was steadily moving on during the long day culminating in the sunset and dusk shots, and the variable weather. 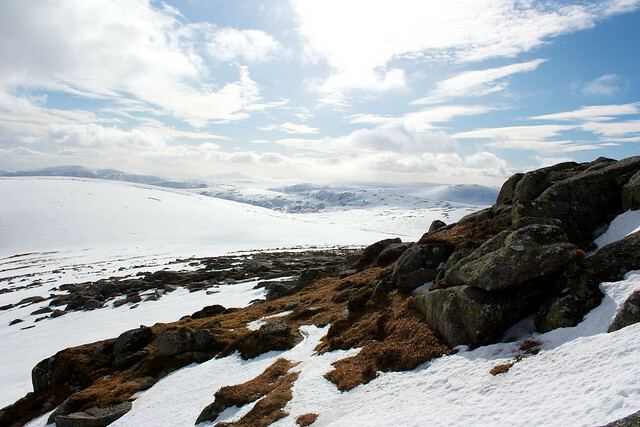 For such a long route and terrain of that nature, perhaps ideal weather but with some hail, snow and mist to give added spice to the jaunt? The star photo rounds it all off nicely. Great job, really enjoyed! That's a great report, and an interesting route. Good way to bag 5 in one outing. 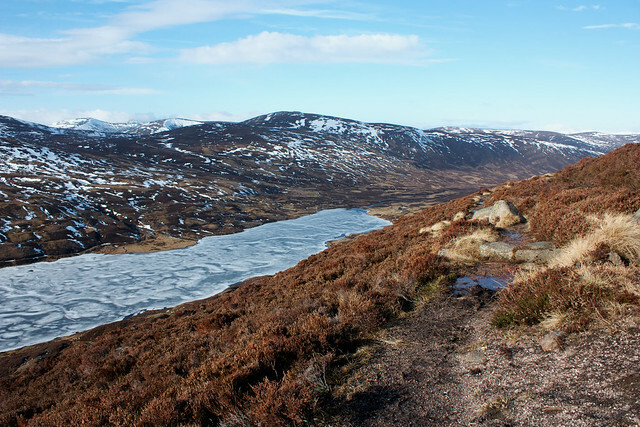 And with a track that looks bikeable up to the lodges even better, although this would mean heading back towards Loch Callater after doing Carn an Tuirc. 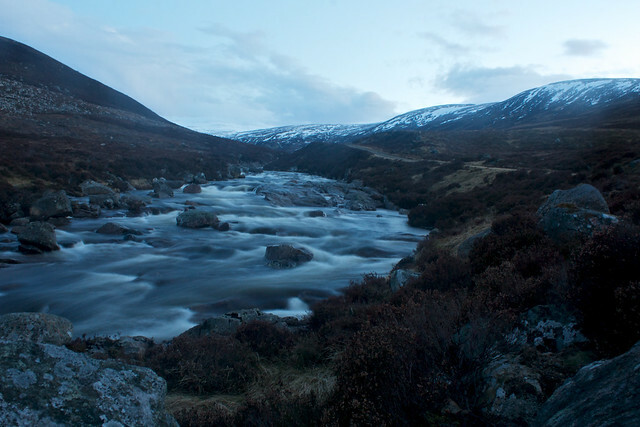 Excellent report, these are some of the best photos of the Deeside area I have seen. The last one of the stars is fabulous. 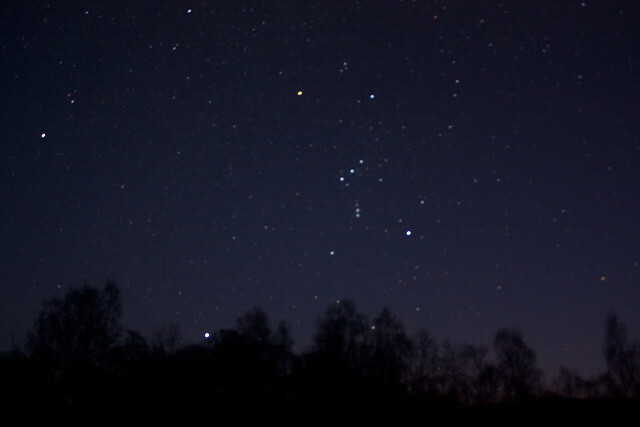 I have often looked at the stars in the Aberdeen sky but when I try to photograph them they always come out too dark.